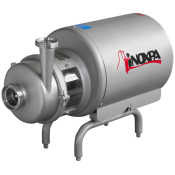 INOXPA's MIX type blenders have been designed specifically for mixing low or high viscosity liquid products for the food, cosmetics, pharmaceutical and chemical industries. For this reason, they are built with sanitary finish. They are classified into five units with their respective agitators. The MIX-1 has a central anchor type agitator, the MIX-2 has a turbine with Cowles disc on the central shaft, the MIX-3 is equipped with a central blade type agitator, and the MIX-4 has both a central anchor type agitator and a radial agitator with Cowles disc. The MIX-5 is equipped with a counter-rotating agitator and a bottom-of-the-tank mixer. The unit includes a sealed tank where the mixing is performed by means of a central agitator (and a radial agitator, if necessary). The lid has an opening which is used for inspection and material loading, the diameter of which is in correspondence with the capacity of the unit. Furthermore, the lid also holds the agitator, with or without lifting mechanism. The agitator speed is controlled by an electronic variable speed drive. 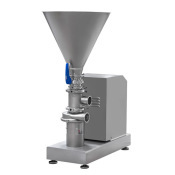 The unit includes a rotary lobe, progressive cavity or centrifugal pump to transport the product from the tank to the exterior or to an intense agitation system, of a disperser, emulsifier, or solid-liquid mixer type. The system also includes an auxiliary loading and additive premixing tank. All this equipment is arranged as a single block assembly that is electrically interconnected and ready to operate when connected to the required ancillary services. The entire unit is mounted on a base plate which incorporates the electrical panel. Available optional accessories are a raw material feed pump, a liquid ring vacuum pump, and a CIP cleaning system. The basic equipment includes a tank, a lid, a agitator or agitators, and a lifting system for the lid with its respective agitator. The entire assembly is made with TRI-CLAMP type connections. The motors and electrical panels are available in IP-55. ATEX protection for motors and electric panels. 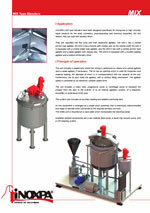 It is possible to add a centrifugal or lobe pump for charging liquid or viscous raw materials. It is possible to include vacuum generation equipment complete with a liquid ring type vacuum pump and pressure control. This system can include a manually operated weighing system mounted on load cells for the charging and discharging of products. A secondary mixing unit can be included to add additives like dyes, preservatives, etc. to the product. It consists of a small capacity tank (50 to 500 useful litres) with dual chamber for heating or cooling. It is equipped with a agitator with Cowles disc mounted on a flat lid. 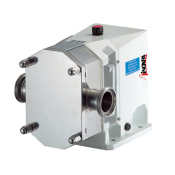 It includes a flow control valve for product discharge. 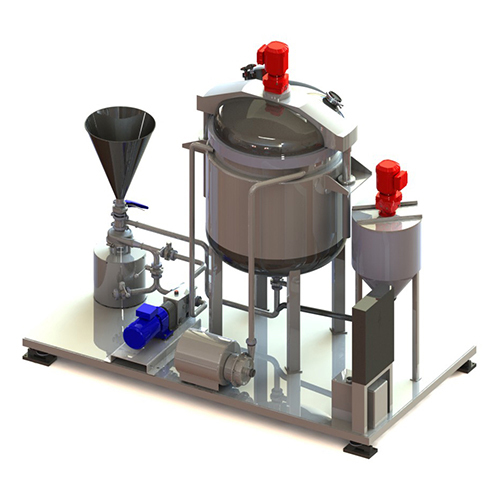 The unit is connected to the suction pipe of the mixer or of the solid-liquid blender in order to add the additives required to complete each individual mixture. On the MIX-5 blender it is possible to replace the auxiliary tank with a melting vat equipped with a blade type agitator and a deflector baffle.